He is not just an astronaut nor just the first man who ever stepped on the moon. He is also a husband, a dreamer, and most of all, a father. First Man uncovers every layer of Neil Armstrong and Ryan Gosling paints the character as a real human. Damien Chazelle’s biopic about the legendary astronaut is such a feat that you will find yourself so engaged in the story. United International Pictures invited us to a private screening for the press of First Man and here are our thoughts about the movie. Chazelle’s film took us for a back ride to Armstrong’s journey to becoming the first man to ever step foot on the moon. From his training up to the actual flight, it was as if we were right there with him. The rather intimacy of each shot was a puzzling choice for an out-of-this world spectacle. That, however, worked surprisingly really well with the director’s intention- to make the most human out of Armstrong. There have been articles about the authenticity of the film’s take on the whole NASA project but personally, I can set it aside and judge the film for its narrative and the actors’ performance. Gosling and Foy delivered phenomenal performances in the film as Mr. and Mrs. Armstrong. Gosling’s restrained and calm performance as the iconic astronaut paralleled Foy’s enigmatically stern acting. First Man was all business with little to no space for humor. But don’t mistake it for a boring Oscar-bait film. The great thing about it is how consistent it was with its tone. With the preparation for the moon exploration as the backdrop, a more grounded narrative is being explored at a more intimate level. As I have said earlier, First Man works best when it goes deep with its character. 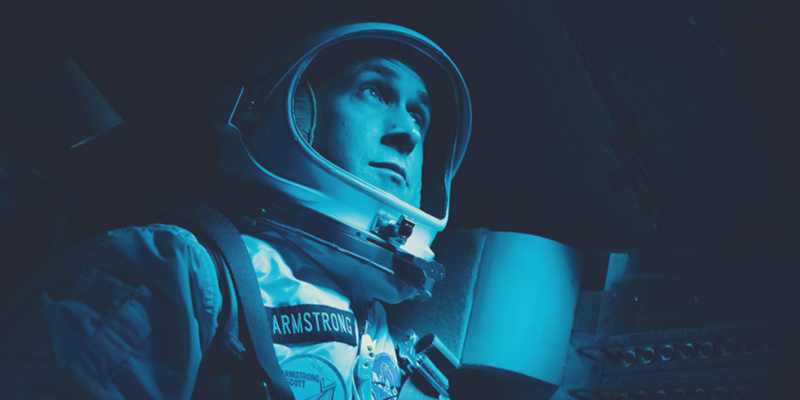 Gosling’s Armstrong is no longer the icon that cemented a spot in the history. Here, he is a family man with aspirations, hopes, and fear. He is a father and a husband whose responsibilities are divided between his family and his dream of setting foot on the moon. Dreams do come with a price and one of which is his relationship with his family. Foy accentuated the family drama with her strong performance as a worried wife. In a community where families have been challenged and with some left as widows due to aeronautics failure, it is just fair for her character to feel that way. In her own subtle and restrained way, it is clear that she has a strong love for her husband and kids. First Man is a highly-restraint and subdued film. While it plays on NASA’s out-of-this-world journey to the moon, it instead focuses on the Armstrongs. There is a particular beauty to the intimacy of the narrative and how it uncovered each layer of the characters. The excitement does not necessarily come from the expedition and Armstrong’s preparation but rather on the interaction between Gosling and Foy. They both command a scene they are in and watching them both together is such an astounding moment. Binge-level: 4 out of 5 stars. PREVIOUS POST Previous post: Do More When You Outsource! NEXT POST Next post: RAWR Awards 2018 Will Roar At Le Reve!